Where 10 years back only handful of the companies had their websites, today it has become a need. Either your business is producing online business or not, but having a website have become one of the must have things today. When the dot-com boom started 10-15 years back then we had very limited resources to build websites. Either html or few web design languages like .net, php were the main developing tools to have a professional website. But the scenario has changed today. Today so many tools are available in the market that you can build your own website by dragging and dropping elements on your web page. Tools like WordPress, blogger, Tumblr, or Website Builder can help you to create a free website. With the help of these freely available tools you can make your own website for free and give it a professional look very easily. Today we are going to learn the step to create a website free of cost with WordPress and Website Builder. Decide you content management system. Pick a perfect domain name for your business. 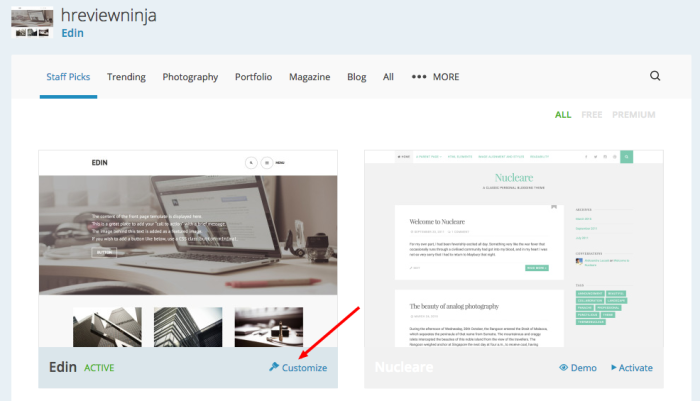 Select niche specific theme for your website. Customize the design as per your need. WordPress is world’s most famous blogging platform. Apart from blogging websites, you can easily create professional website with the WordPress by selecting right theme for your website. Here we are going to give you step by step instruction to create a free website with the WordPress platform. Write down the name of your website. Note: Try to capture good name for your website by spending little more time. Choose a perfect design for your website. Note: WordPress has thousands of free designs so you can select anyone as per your needs. Your free website is ready to go. How to edit the theme design? Theme editing is itself a task and you might love to select the best design for your website. Here are the steps to edit your WordPress theme very easily. Step #1. Login in your account and click on “My Sites” on top left corner. Step #2. Select the website which you want to customize. Step #4. Activate the theme and click on customize. Step #5. Select all the elements and customize accordingly. So with this method you can edit your theme and make it look perfect. You might be thinking (if you are little bit aware) that why I have suggested WordPress only? There are tons of options available in the industry then why only WordPress? Let’s see why this is the best platform. This content management systems is one of the most widely used system in the world. 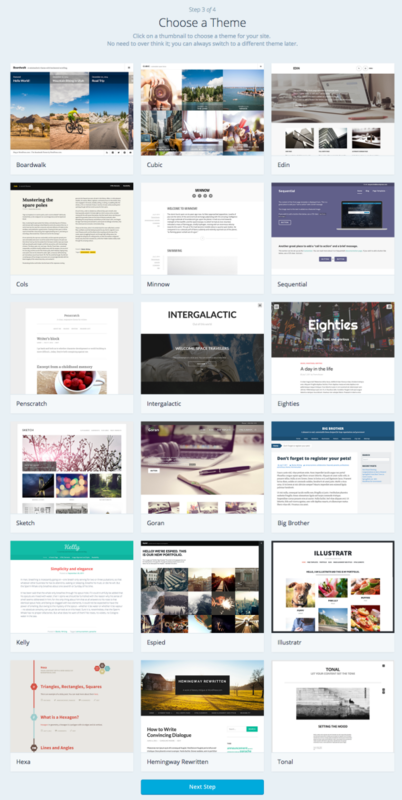 You get tons of free themes in your dashboard. You save your precious money. It’s a very secure CMS. You can discuss your problem with world class experts as WordPress has very big community. It has built-in comment system so it’s 2 way communication system. It gives your business more brand awareness. 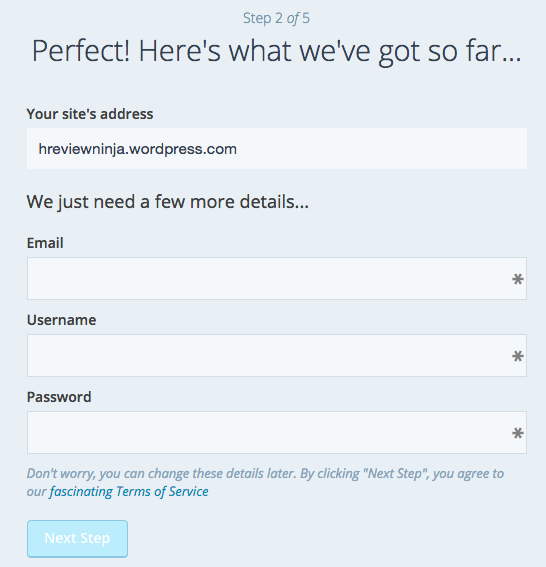 Working with the WordPress is damn easy. Themes are mobile friendly so no need to invest more money. People keep launching new themes every month. Note: As you are using FREE WordPress, so you won’t be able to add third party themes or make any changes in the themes. For that flexibility you’ll have to pay $99 extra to activate those features. 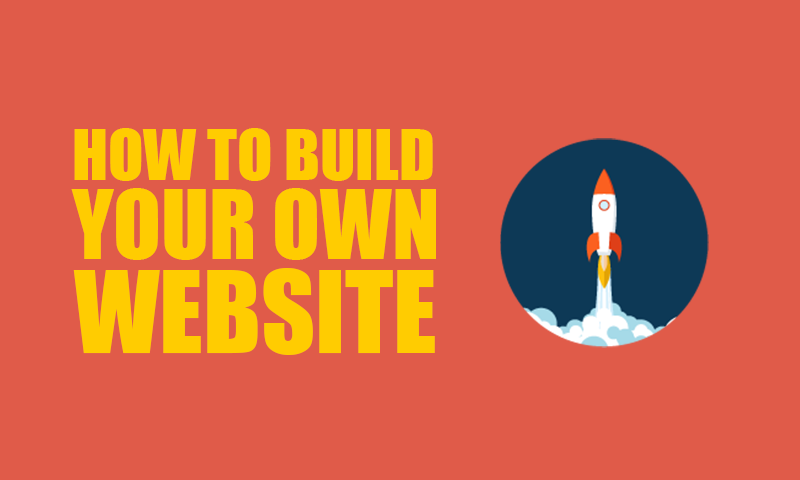 As this guide to build your own blog was targeted to teach the procedure with FREE WordPress, but you can go for the paid option if you want to have more features. You can check the following picture to understand it easily. 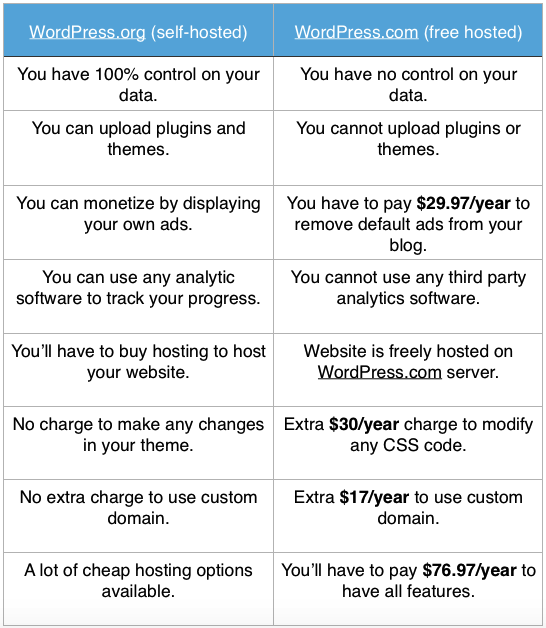 As you can see there is a big difference between free and paid WordPress hosting. If you are a newbie in online marketing then you can start your free website with WordPress.com but if you want to build a serious business online then you can go for paid WordPress hosting. To use paid WordPress hosting you’ll have to buy a stable hosting which will help you to store your data online. In other words you need a server to host your data. We recommend some of the top web hosting companies like WPEngine and BlueHost to buy cheap hosting. Both of the hosting providers are one of the top players in the market and millions of websites are powered by these hostings. You can read our articles to check about these hosting and see why are we recommending to use them. We recommend to start your online career with the stable hosting providers so that you can make your own blog stable to secure. Although FREE WordPress hosting is a good option to start a website, but keeping long term goal in mind we recommend good hosting provider to create a website. If you have any question regarding hosting selection then feel free to contact us.